One of the many industries our clients serve is the athletic industry. When supplying gym lockers to schools, athletic departments, sports clubs, commercial gyms, or anyone else, you need some who can deliver an order to your exact specifications of both time and design. At Miller’s Casework, we place customer service above all else, so you can rest assured your experience with us will be smooth from start to finish. We don’t believe that respect, attentiveness, and a can-do attitude are options or upgrades – they are standard practices you will find with every member of our staff. 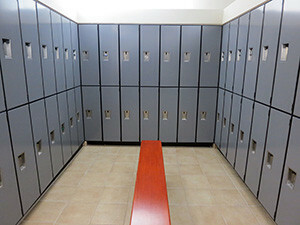 When you choose Miller’s Casework, you’re choosing to work with experienced professionals who have the skill and craftsmanship to design the perfect gym locker. The owner of Miller’s Casework, Albert Miller, comes from a long line of Old World woodcrafters. He has passed this knowledge and craftsmanship onto his staff and incorporated modern techniques and tools to create the ideal balance between classic and modern. Based out of Sparta, Tennessee, we are proud to offer a wide variety of gym lockers to casework distributors and vendors in Tennessee as well as strategic parts of Alabama, Georgia, and Kentucky. The towns of Sparta, Cookeville, Crossville, Knoxville, Morristown, Kingsport, Johnson City, Sevierville, Marvyille, Cleveland (TN), Chattanooga, Columbia, Murfreesboro, Nashville, Jackson, Clarksville, Springfield, Gallatin, and Hendersonville are our primary service areas, but we are happy to discuss the needs of those in other towns as well. Metal: Provides great strength and durability. The classic school gym look. Plastic: Ideal for high humidity environments. Plastic will never rust or corrode. Phenolic: Even stronger and more durable than metal. Also allows for a high degree of design flexibility. 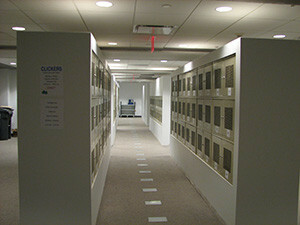 Cubbies: We can even provide no door, non-locking cubbies for more open environments. We make quality a priority at Miller’s Casework. High quality, durable construction is at the core of everything we do. From top to bottom, inside and out, we won’t rest until the job is done and done right. 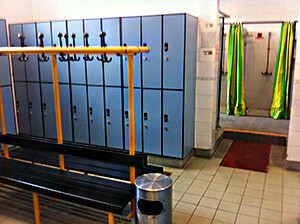 Give us a call today to discuss your gym locker needs. We provide free quotes at 931-739 – 9292!